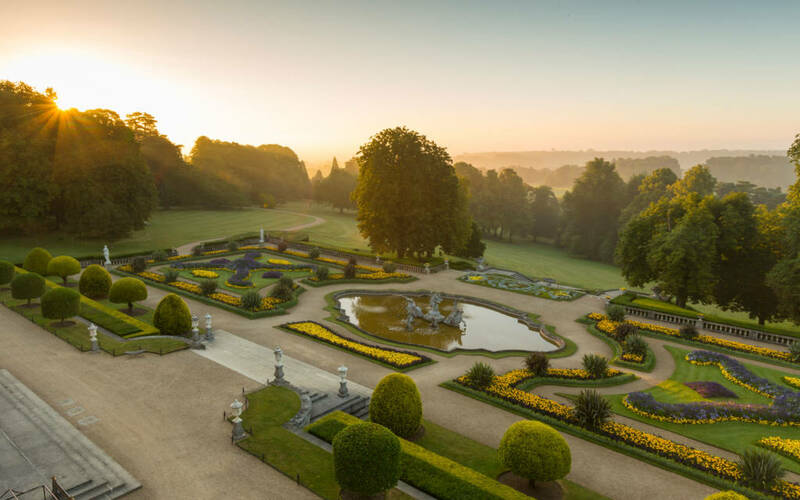 Waddesdon is famous for carpet bedding and each year we change the design of the beds on the Parterre and on either side of the South Fountain. The gardens team, helped by volunteers, plant a Spring and Summer scheme in May and October, using around 110,000 plants and bulbs. 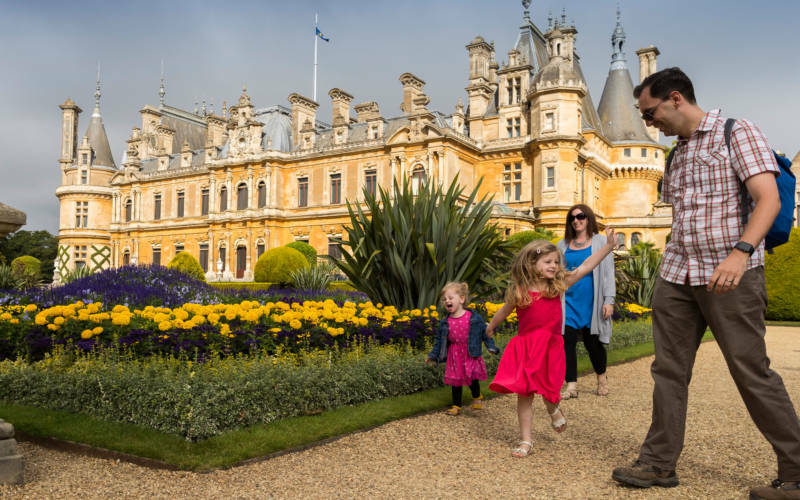 When Baron Ferdinand built Waddesdon from 1874, the gardens, and particularly the views of the garden from the house, were a vital part of his vision, to create something beautiful for his guests at every turn. He and his French architect, Gabriel-Hyppolite Destailleur, designed the layout around the house, including South Terrace and the Parterre, a French-inspired formal garden made up of a symmetrical pattern of beds set off by mown grass and contained by neat pathways and low clipped hedges. Parterres are usually designed to be seen from above, in our case from the raised terrace and the main reception rooms and bedrooms on the south side of the Manor. 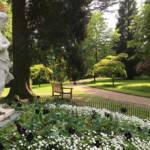 The centrepiece is a magnificent fountain, originally made for an Italian palace in Colorno. 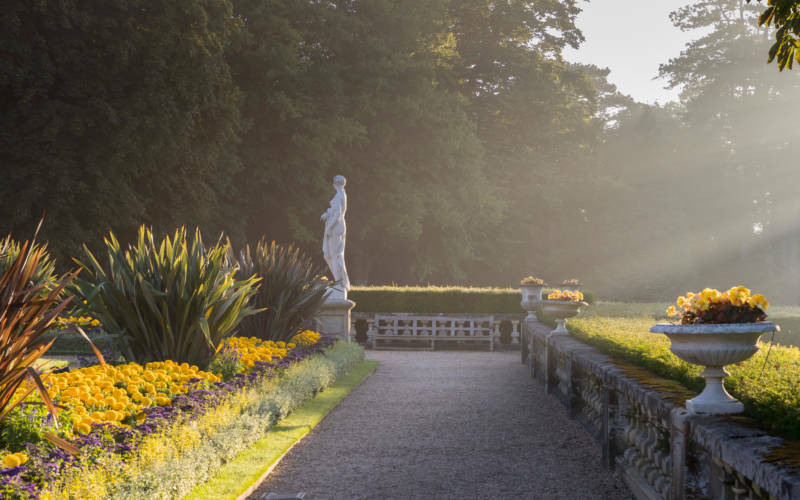 The parterre at sunrise. 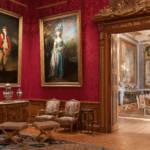 Photo: Chris Lacey © National Trust, Waddesdon Manor. 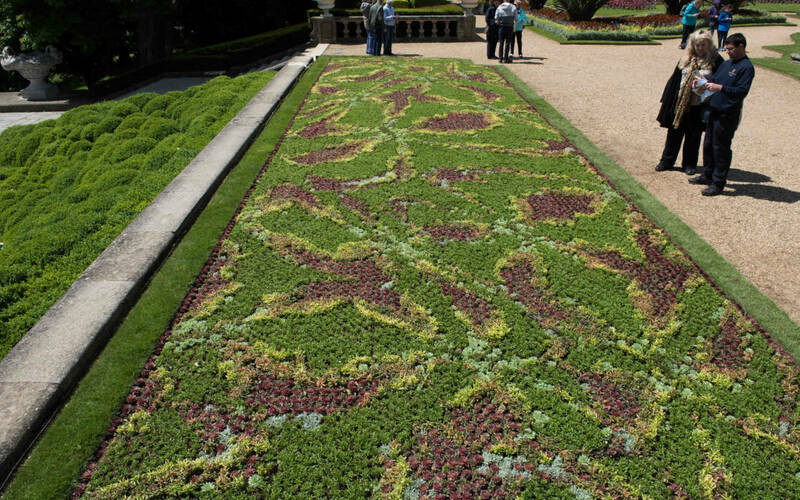 The two side panels of the Parterre are ribbon bedding, which as the name suggests, means narrow, scrolling beds, mounded to give height and depth of colour, which are planted with bands of different species. To the north and south are the carpet beds, larger panels of planting, which can be used for more complex designs. Each bed is made up of some 26,500 tiny plants specifically chosen for their compact habit to create a living mosaic. In fact the French name for carpet bedding is Mosaiculture. In 2000, we launched an initiative called Art in the Garden, when a contemporary artist was invited to design the bedding. Early collaborators included John Hubbard and Oscar de la Renta. Now, we also make a link between the exhibitions or displays in the house. Our 2016 carpet bedding based on the Red Drawing Room carpet. Photo: Chris Lacey © National Trust, Waddesdon Manor. The design this year is inspired by our exhibition Creatures & Creations, which is in turn inspired by Walter Rothschild’s extraordinary collections of natural history. The artist is Platon H, who has used Walter’s collection as the source for a series of colourful, abstract digital collages. This design is based on a flame lily named for the family – Glorisa superba rothschildiana. 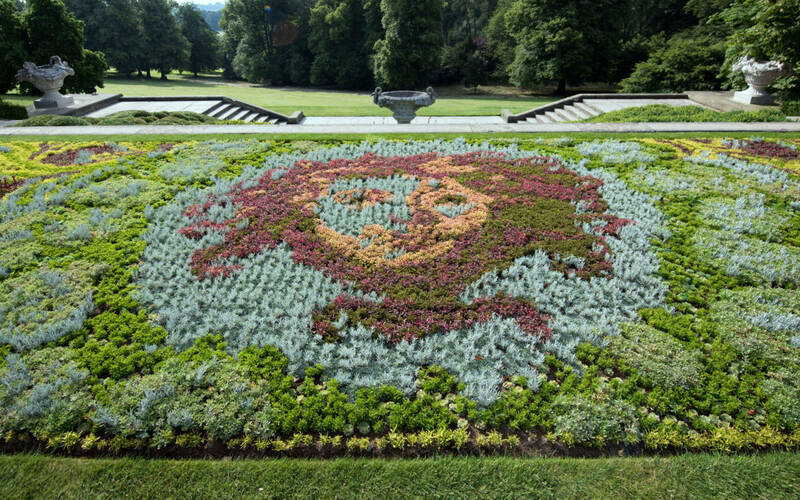 Our carpet bedding for 2017 designed by Platon H. Photo: Derek Pelling © National Trust, Waddesdon Manor. Once the design is agreed, the Gardens Dept work out which plants should be used to determine the desired colour, texture and pattern, and it is sent to Kernock Park Plants, a specialist nursery in Cornwall. The design is translated into a planting plan, using a digital system called Instaplant. Each plant is represented by a dot on the plan, rather like a pixel, and the system then divides this picture into sections, about the size of a piece of A4 paper. These are then planted up as trays which are grown on in the nursery, over several months. Some plants are allowed to produce a controlled amount of flowers and others need to be manicured on a weekly basis. When they are mature, they are rather like carpet tiles. In Baron Ferdinand’s day, it took his large staff of gardeners several weeks to install the bedding, but today, thanks to the trays, our present team can assemble the whole scheme in only one day! Watch this short film to see how it’s done.